We are very excited about the launch of our new book ‘Farmer Pete Has Stinky Feet’. We are thrilled with all of the amazing feedback that we have been receiving on our sweet and funny tale of a farmer with a stinky problem. To celebrate, we have a series of farm themed arts and crafts coming up inspired by the book. I love tree of life pendants and sculptures. They are just so pretty. I have wanted to do a tree of life craft for a while and this weekend, we finally did. We are so excited at how beautiful these came out. This paper plate tree of life craft is also great for working on those fine motor skills. Yarn wrapped crafts have always been a favorite of ours. We have made yarn wrapped hearts, dolls and even bumble bees, but nothing has ever seemed quite as fitting to be wrapped in yarn than these winter hats. These yarn wrapped winter hats are a cute, colorful and a wonderful craft and activity to exercise those fine motor skills. These clothespin horses are a fun craft and are great to use in pretend play. Make a whole stable full of different horses. Clothespins and craft sticks are two things that work well together. Just play around with them a little and see. You can use them in learning activities, engineering opportunities and many wonderful crafts. We love these clothespin horses and unicorns. These are so easy to make and are simply adorable. Printmaking with CDs offers a variety of options and is easy for preschoolers to adults. If you follow us regularly, it is probably no surprise that we are a bit obsessed with printmaking. We love stamping and printing with everything and anything. Recyclables and common household items are our favorite materials to use. If you are like us, you most likely have a few old scratched up CDs or DVDs sitting around. 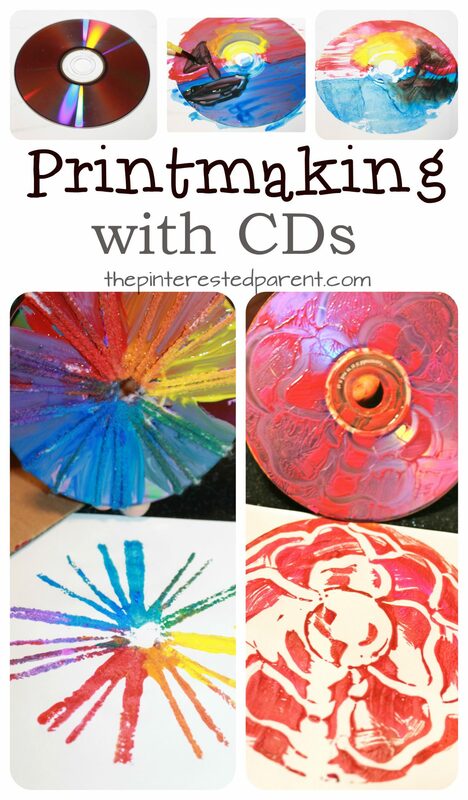 Well don’t toss them out just yet, instead how about experimenting with some of these simple printmaking with CDs ideas. Inspired by the beautiful book ‘My Color is Rainbow’, this rainbow collage is a colorful kid’s craft that is great for working on scissor skills. My daughter and I love to discover new books. That is why we were so excited when Agnes Hsu, the author of the amazing blog Hello Wonderful, published a new children’s book. Our whole family immediately fell in love with ‘My Color is Rainbow’. The story of Little White Arch is a beautiful one with a wonderful message. You will want to follow him on his colorful journey again and again. We felt so inspired by the story and its illustrations that, of course, we had to make a craft to go with it.